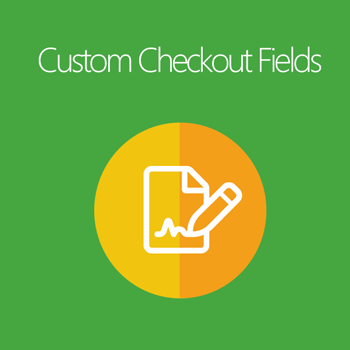 Custom Checkout Fields extension by Mageplaza allows online stores to add more checkout fields and display them on the different positions on the checkout page. This extension helps admins to collect sufficient information at the checkout step, perfect the order process, and satisfy customers. 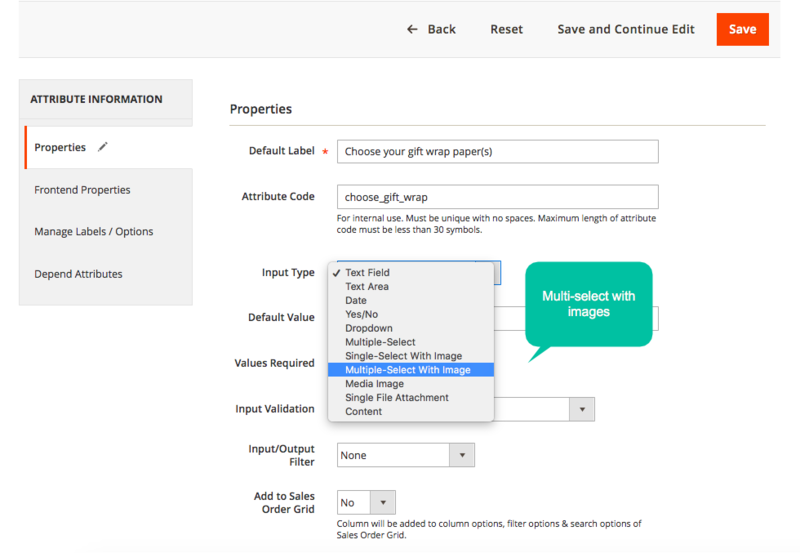 On Magento 2 Default, the checkout fields only include some familiar information such as name, email address, delivery address and shipping method. That store owners get all specific information of orders makes the trading process much easier. When processing orders are faster, customers will feel more contented. Consequently, they are more likely to keep buying from the store and become loyal customers gradually. 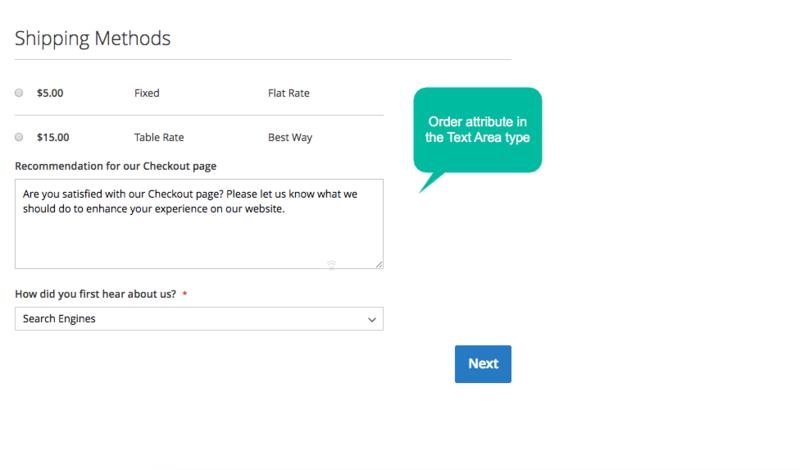 The additional attributes to the checkout page with the expectation to understand customers’ wishes or feedbacks will help stores prove to be customer-oriented and more professional. 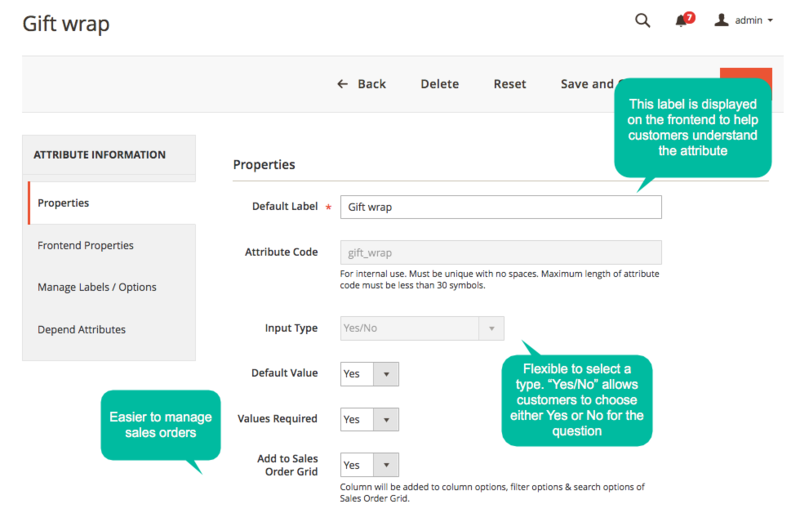 When Magento 2 Custom Checkout Fields is installed, this extension allows admins to create more fields on the checkout page. In addition, this extension is highly compatible with Mageplaza One Step Checkout. What another address can you receive the product? What time would you like to receive the product? What are your favorite products which you bought from our shop? Would you like to use the gift wrapping service? Please select your preferred gift pattern paper? Do you have any other notice before delivery? Do you have any feedback for our store? And any attributes without limitation if store owners find it necessary to process the orders successfully. Depending on the kind of attributes, product types or certain purposes of store owners, the input types are selected suitably. 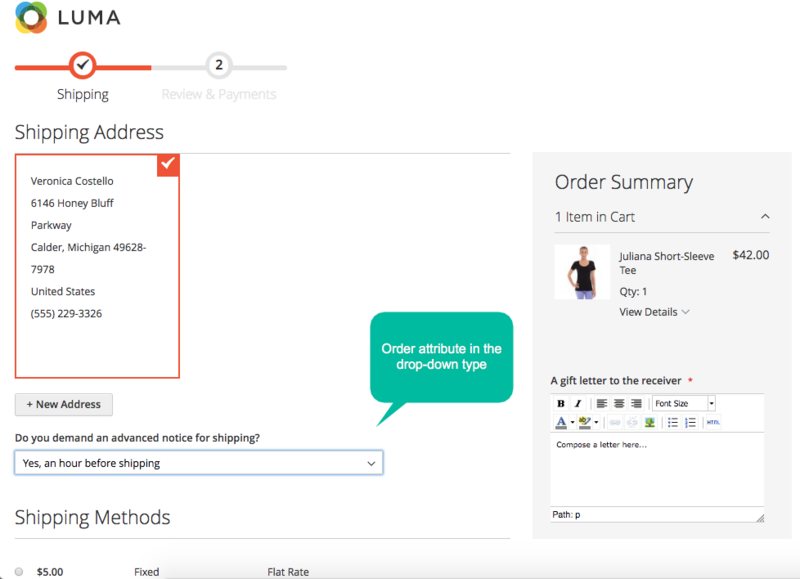 In addition, a checkout filed can be displayed based on the selected shipping method. For example, gift wrapping will be applied with the shipping service as priority or first-class. 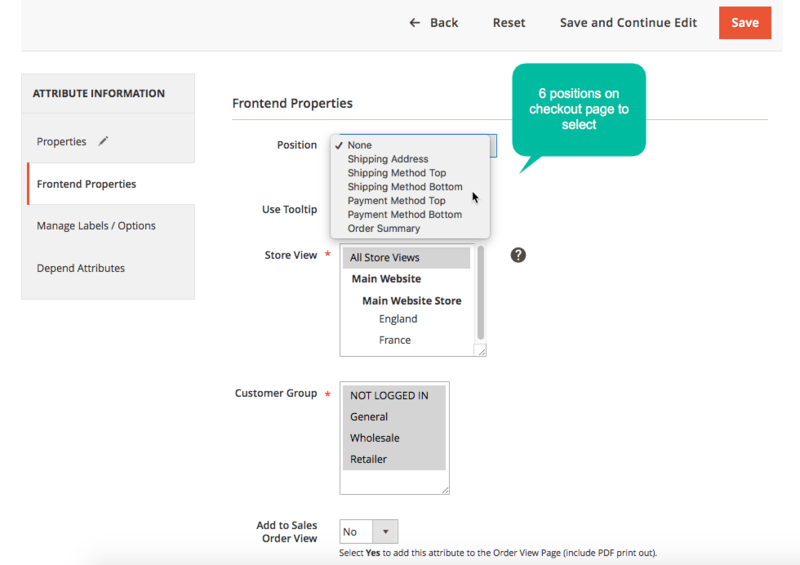 With the frontend, on Checkout Page, additional checkout fields can also be added to different sections as Shipping Address, Shipping Method Top, Shipping Method Bottom, Payment Method Top, Payment Method Bottom, and Order Summary. 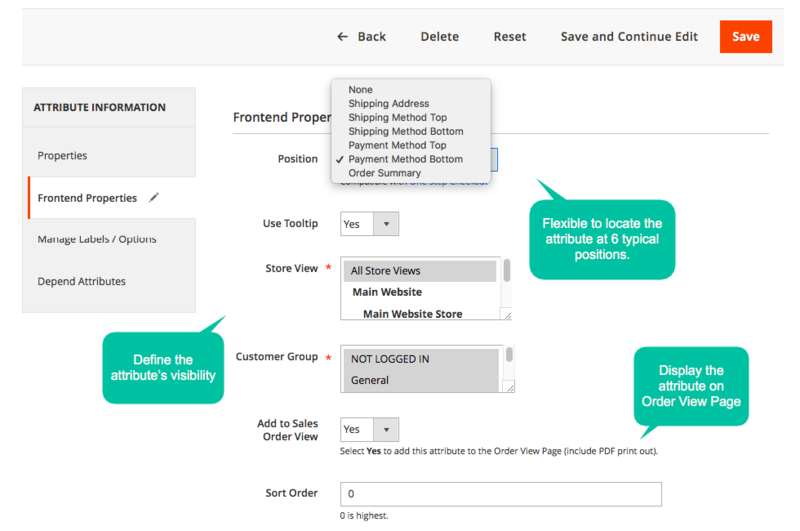 Besides, login customers can view these attributes via the Order View Page. Require the input data (such as email, phone, URL) to follow standard formats. 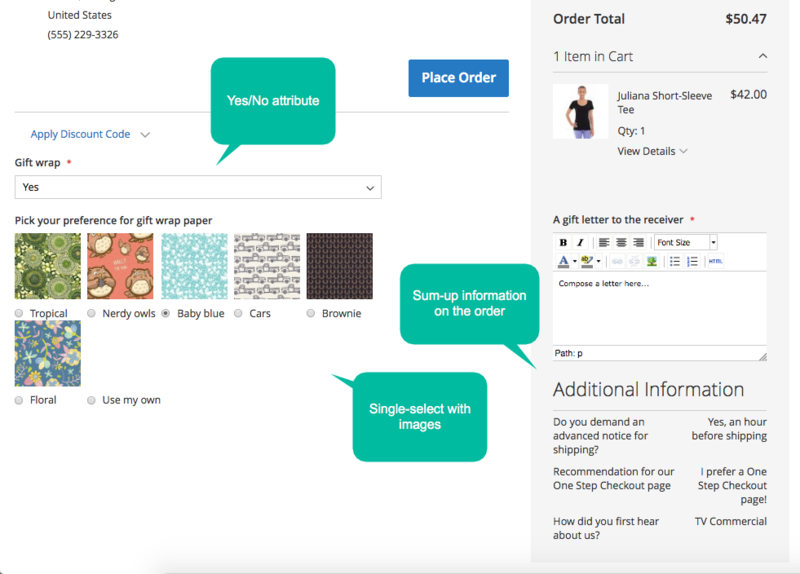 Set a checkout field to be visible to specific store views or customer groups. Set the priority for displaying checkout attributes. The smallest number has the highest priority. 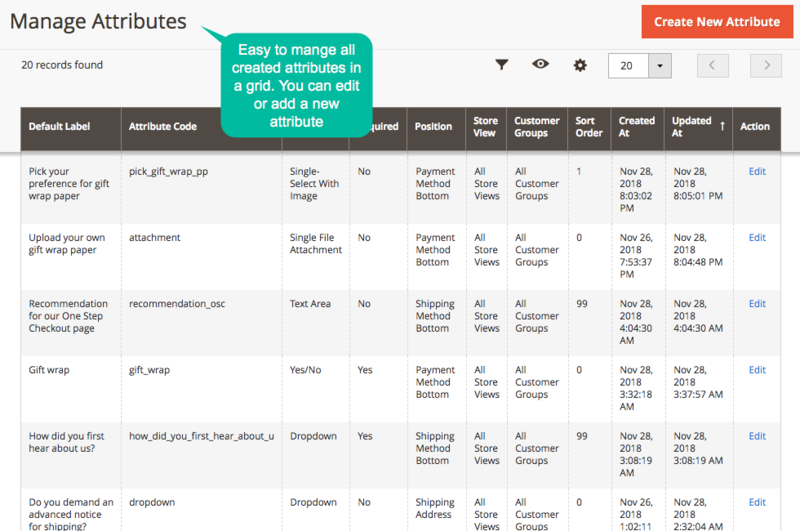 Select store view and customer group that a field is visible to. filter_drama I want to add the checkout fields to PDF Invoice attached to emails sent to customers. Is it possible? Yes, absolutely. 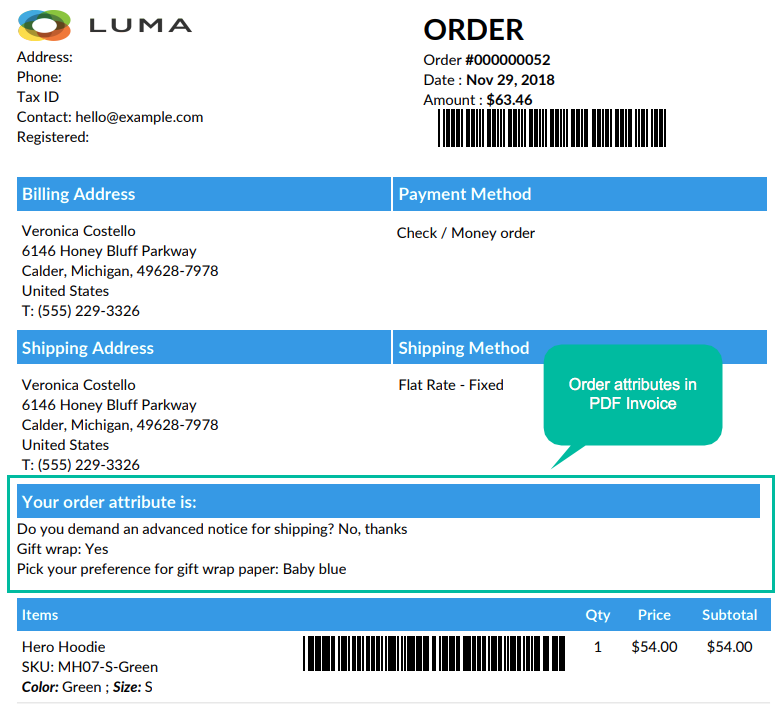 please follow this tutorial: How to insert Order Attributes to PDF Order Template. filter_drama I want the checkout fields to appear in transactional emails. How to do this? To add order attributes to transactional emails, please follow this tutorial: How to insert to Transactional Emails. 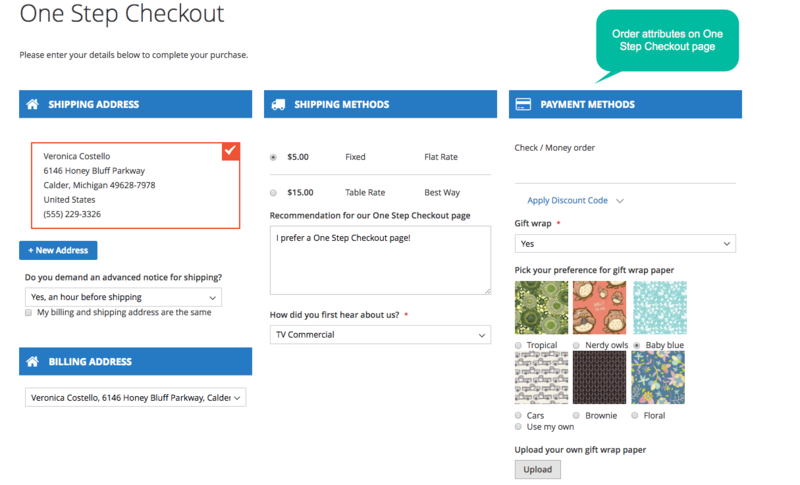 filter_drama Is Custom Checkout Fields extension compatible with my One Step Checkout page? Yes, the module is properly compatible with Mageplaza One Step Check out. Both extensions support each other very well. filter_drama I want to create the Order Comment section on my checkout page. Is it possible with Custom Checkout Field? Yes, it can be done easily by creating the new attribute named Order Comment from Manage Attributes section from admin backend. filter_drama Is it possible to create the Delivery Time section on my checkout page? 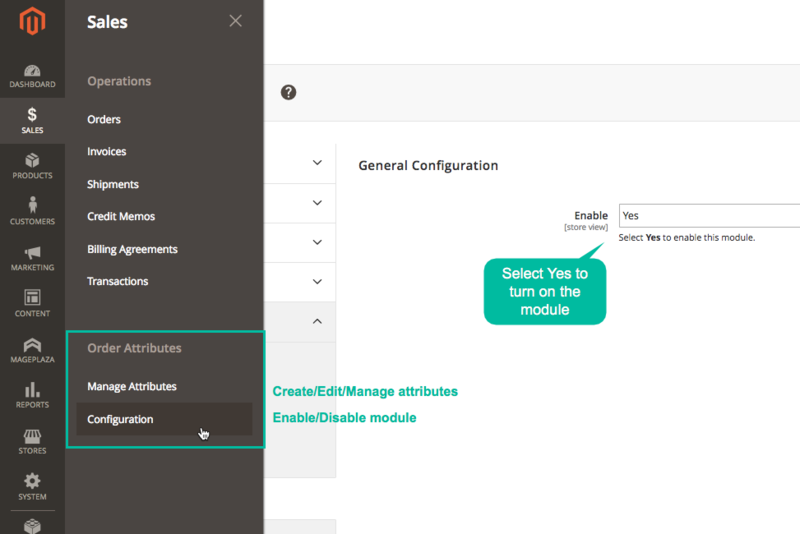 Yes, it can be done easily by creating the new attribute named Delivery Time from Manage Attributes section from admin backend. 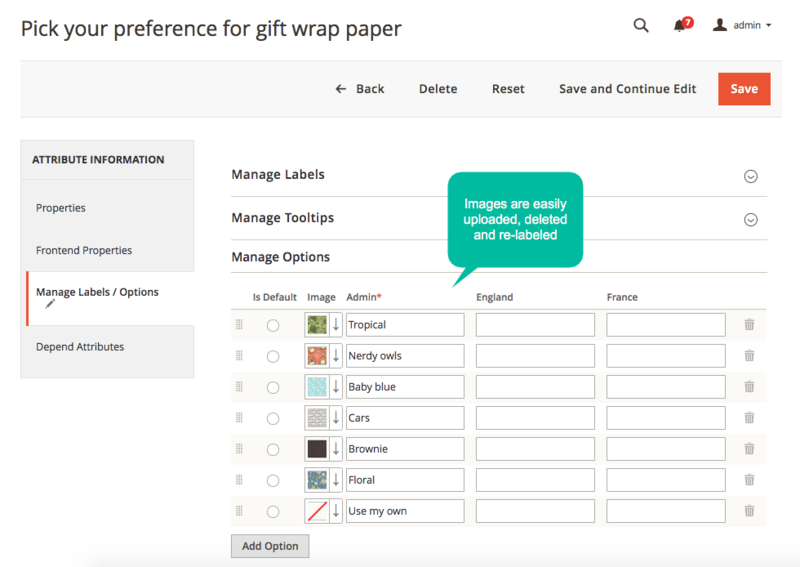 filter_drama My store provides gift wrapping service and I want my customers to choose the gift wrap paper on the checkout page. Is this possible? 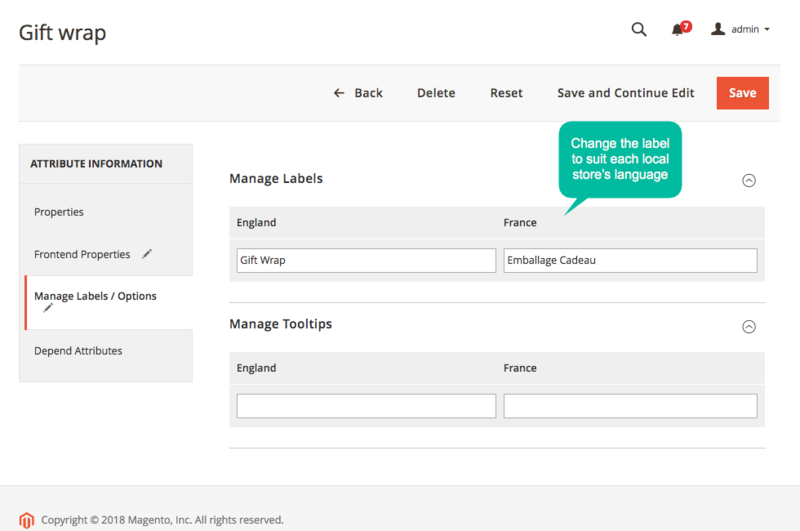 Yes, it can be done easily by creating this field from Manage Attributes section from admin backend. 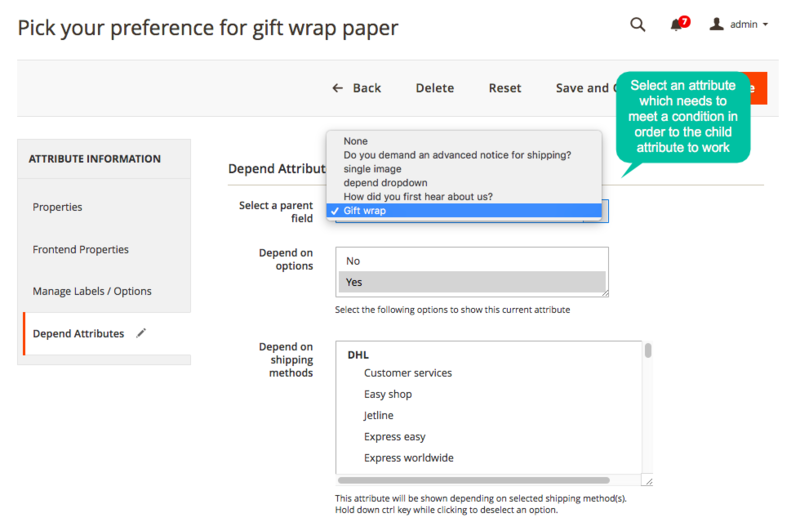 Note that please select drop-down input type for gift paper selection.